You thought Michael Jackson's arcade fetish started and ended with Sega's R360 and Namco's Ms. Pac-Man? You have no idea how much hardware this man owned. The gloved one had a massive arcade. While Jacko's arcade collection was briefly touched on by the mainstream media previously, the full auction catalog provided by Julien's Auctions reveals an enviable line-up, full of video games, pinball tables and arcade amusements. Jackson had taste. 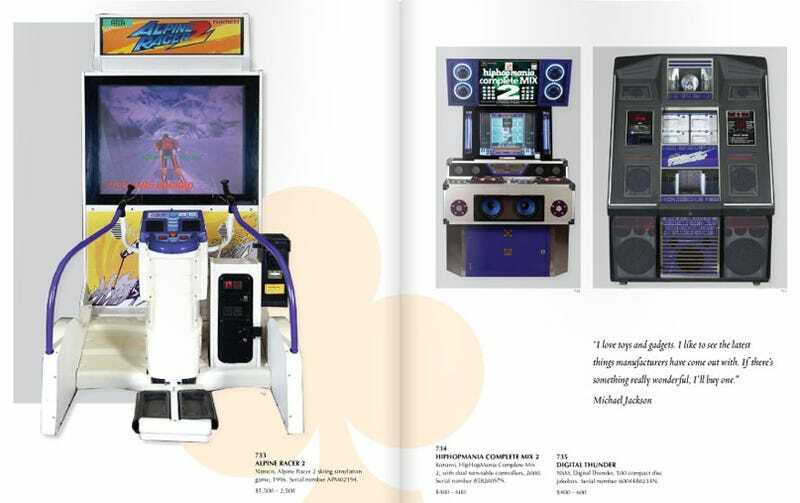 The King of Pop's collection of arcade cabinets and game ephemera spans a good 60-plus pages, full of titles like Jambo Safari, Mortal Kombat, Tekken 2, Guitar Freaks, Galaxy Force II, Super Street Fighter II and two versions of Crazy Taxi. Clearly, Jackson likes his Sega hardware, opting for the deluxe versions of the company's biggest arcade efforts. Jackson also had plenty of terrible arcade games at his Neverland Ranch, including Time Killers, Revolution X and Beachhead 2002. Mike even has a Virtual Boy display kiosk, showing his taste ran the full gamut. The full line-up is astounding. Check it out.